Day 9. New Year's Eve. Plan of action today: book train tickets to Laos. Despite advice from the receptionist, we decided to skip the subway and walk the equivalent three metro stops to the Hua Lamphong Train Station. Turns out its an hour away on foot, but we still got to see mass gatherings around a Buddhist temple and meet a random old Thai guy who's opener was 'I think you look like an Indian'. Lol. But turned out to be of help as he walked us to a tourist information centre on his way home. Found out the buses are slightly quicker to Vientiane, but £10 more expensive, and also because it's new year, the train and bus won't run on 2nd Jan, so we'd need to travel on the 3rd instead. Went onwards to the train station, booked our tickets for £12 each, then headed back to Silom for a wander round. This area is part of the business district, so has tons of shops and shopping complexes. After getting ready for the party in the evening, we headed to a nice Italian wine bar for some lush pasta and steak with a few glasses of wine, then headed over on the Sky Train to Sukhimvit and a short walk to the Queen's Imperial Hotel. The entrance was huge, with lots of people arriving in cars and taxis being whisked away inside with their swooshing long black dresses. Wasn't sure if we'd come to the right party, but turns out they also had a Dinner Gala there as well. Phew! Inside, quick queue for tickets and ride to 37th floor to the roof top. There was two main areas: one with a DJ and a small dance area next to the bars, and another with a large stage and bigger dance floor. The place was packed with lots of tourists, and there was lots of lights and laser projections onto the walls, more like a club than a rooftop bar. The DJ was apparently from England and would keep shouting either 'bass, bass, bass!' or 'oggy oggy oggy!'. Lol! The countdown was projected onto the walls until the firework display started. 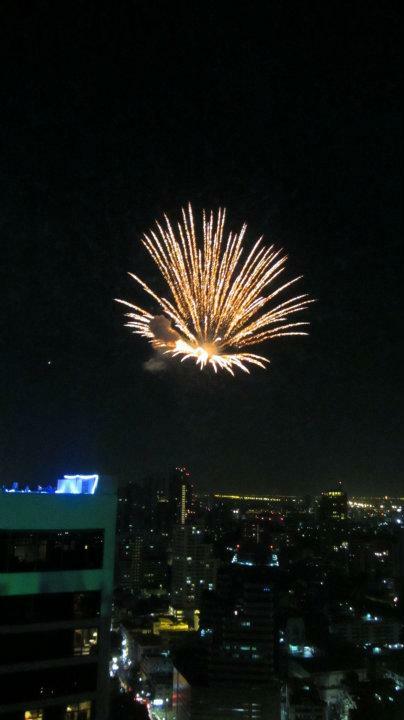 There was another rooftop party at a hotel close by with a slightly delayed countdown, which meant we got to see two firework displays close up, with Central World Plaza's display off on the distance. Once the Happy New Year's had finished, the DJ went into a slightly distorted version of Smells Like Teen Spirit, whilst the merriment continued well into the night. After a while the roof started to clear, and the DJ on the main stage had changed (music got pretty bad after this point) so we decided to head on home around 4am. Brilliant night and a great way to see in the New Year. Seems crazy that a year earlier we were in Bristol banging pots and pans in the rain wondering how we'd be seeing in 2013. Once home we were straight on the phones to England which felt strange seeing as it was still 2012 over there for a few more hours. What a great night. Day 10. New Year's Day. Lazy day - woke up late with another hangover (thankfully nothing like the movie) and eventually sauntered out into Silom around 3pm for a mammoth feast, Chinese Style. The meal was epic - sweet and sour pork, beef, vegetables, dumplings. Was amazing we left feeling stuffed and carrying two roses (New Years gifts from the waiter. Cheeky Happy Hour cocktails, then back home to book flights, hotels and upload photos in the end. Mike got to speak to his parents whilst I pigged out on the choc bars Mike brought us to get though the gruelling photo uploading session. Our train to Nong Khai (Thai border with Laos) wasn't until later (around) 8pm, so this day we spent time changing currency. Who knew getting US dollars and Lao Kip would have been difficult, but after going to all the exchange places we could, Bangkok Bank was the only one that could do it. Stopped off for dinner at a Japanese fast food place and some Dunkin' Donuts. Finished them off back at the hostel before heading off to Hua Lamphong for the train. It left on time at 8pm and was great. The carriage had 40 beds arranged as double bunks next to the windows. Initially the lower bed was in two seats while the top was folded up before one of the attendants came to make them all up. Me and Mike had both the top bunks, with a Laos lady and her son on the bottom bunks. Slept on and off mostly as the lights stayed on all night, though much better than the sleeper buses so we were alright :) Next stop Vientiane.